Without any doubt, the most rewarding part of our work during the last 30 years has been meeting so many special and wonderful people. Margaret McArthur and her late husband Ken came on the first Walkabout tour in Sept. 1986 and she has written a little story about our humble beginnings. As one of the initial walkers on their first adventure into the Fraser National Park in Vic, I would like to share some memories about our many walks with Graeme and Gabriela. 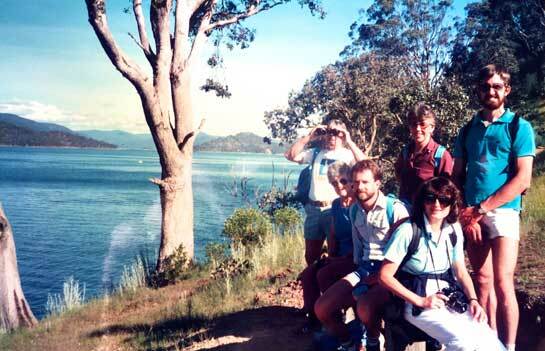 In 1986 our close friends Jeanie and Alan Todd had been inspired by Graeme and Gabriela of Walkabout Adventure Tours - which they were initiating at a tourism expo in Melbourne and suggested my husband Ken and I join them on a weekend to fraser National Park. We, in our mid fifties, and not experienced walkers, were concerned about keeping pace with the unknown walkers whom we expected to join us. We stopped for coffee and lunch en route, and arrived at the campsite in time for a leisurely walk around the lake, then time to ourselves, while they set up camp and prepared the evening meal. However to our amazement - when we returned - there was a table spread with white cloth, Candelabra, flagons of wine, and enticing platters of food surrounding 2 fondue pots. Needless to say we had a wonderful evening under a starry sky - not daunted at all by Gabriela’s only omission - being the fondue forks! In true Aussie style we made gum tree forks, which did the job adequately. To end the perfect day we were each given a T-Shirt with logo, as the first guests of WGA. We retired weary and full of good cheer, to our 2/man tents erected by Graeme earlier. Next day began with breakfast in style, proudly wearing our T-Shirts. Lunch was again very welcome and enjoyable, before returning home happily satisfied with our introduction to Walkabout Adventure Tours as they were originally called. That was the start of many happy adventures with WGA in Australia - then one evening around the campfire at Wilsons Prom, the possibility of European tours was discussed - excitedly we and our friends immediately booked to tour in 1990 which eventuated and was fantastic! - walking in the Black Forest, playing the Alphorn in our 400 year old Swiss Chalet accommodation, and a husky ride on The Jungfrau saddle in brilliant sunshine, were some of the many highlights. We have all enjoyed many adventures since, and happily reminisce at our annual reunions when Graeme and Gabriela and family visit Victoria each summer. On behalf of 'the Mornington Mob', I thank you Gabriela and Graeme for initiating those journeys, and for your family friendship over 30 years."